Another double shot of my baby's love, or in this case Dorkland! Roundtables. I spoke with George E. Williams (also known as Loki). You may know him from the Planewalker gaming site, or with his work as a freelancer on some cool Pathfinder material. We talked about his gamer origins and some of our favorite ways to prepare and/or eat alligator. This is the point at which I would say "it was a fun talk," but that is starting to become a bit of a cliche in my writeups of these Roundtables. I am enjoying the reveal of the things that make us similar as gamers, but I am finding those bits and pieces that make us unique from each other to be even more interesting to discover. I think most of you know who Jason Morningstar is, after all Tabletop did do an actual play of his game Fiasco, and there are many, many more people who watch them than me. Up at that link some people play a game of Fiasco (although according to Jason in our interview they do get a few things wrong, but that's OK too), which is interesting to watch. I admit that I've seen Fiasco at some stores around town, but I haven't played it myself. It does look like it could be fun. He also talked about the origins and development of his latest (at the time of this interview and post) game Durance as well. This was an interesting interview. We talked about a lot of Jason's games, but we also spent time talking about his interest in LARPs (Live Action Roleplaying, just in case there's someone who reads this blog and doesn't know what that means). LARPing is another one of those things that I have never done, but find interesting, so the conversation was of interest to me. I should look into finding some people involved with LARPing for future Roundtables. So, at the beginning of this post I talk about discovering the differences that we have as gamers. I think that those differences is where the interesting stuff all goes on. Some would have you believe that there is this monoculture of geekiness, or even of gaming, but I think that these interviews start to show something different. Yes, there are points of similarity in us all...many of us entered into gaming through some of the same games, or we have some similar interests, but as time passes those similarities start to drift and become less and less important as we find our own voices. Nothing is as important as finding your own voice, even if others don't like it. I have fallen terribly behind on posting my Dorkland! Roundtables to my blog. To catch up I am doing a two-fer of Steve Russell and Ben Gerber. I spoke with Steve Russell of Rite Publishing. Steve's company is a 3PP (third party publisher for those not hip to the lingo) for Paizo's Parthfinder RPG, as well as having an upcoming game using the system from Erick Wujcik's trendsetting Amber Diceless, produced under license from the current rights holders of the game. Steve gave some interesting insights into being a small press games publisher during our talk. and Ben Gerber, creator of the Troll In The Corner website and the delightful role-playing game for children of all ages, Argyle & Crew. We talked about returning to gaming, and taking that interest in gaming from blogging to design to publishing. Ben also talked about the board game that he is working on, that he hopes to find a larger press board game publisher to pick up from him. Both were great interviews and gave some interesting perspectives on being a small press publisher. 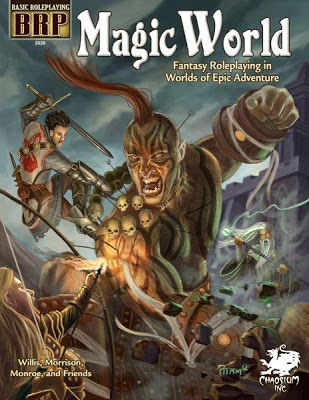 There is also further support for Magic World past this core book planned, so stay tuned for more to come. Between this book and the new edition of OpenQuest coming, I am very excited for percentile-based gaming. As many of you know, I use Google+ Hangouts and YouTube to record interviews with various people in gaming, designers and publishers mostly. I also use them to run a couple of games and record them as well. I was looking at some of the anayltics that YouTube provides and found them interesting. I'm not sure what they mean to me, or what they should mean to you, but I thought that I would share them anyway. This particular table is over the last 30 days. I think that it is interesting to see how long people are actually watching these interviews (and the one actual play video that made this list). It might not mean anything, but still it is interesting to see. The gender breakdown over the last 30 days is Male 84.6% and Female 15.4%. I'm assuming that information is taken from accounts, but I don't know. The Kickstarter for the new edition of the seminal British Science Fiction classic The Terran Trade Authority has started. If you don't know about this incredibly cool space opera setting from the 1970s, check out the Wikipedia page for a bit more information. This edition will featuring role-playing rules, in addition to the setting material, for the Savage Worlds game. Click below to go to the Kickstarter page for this project.